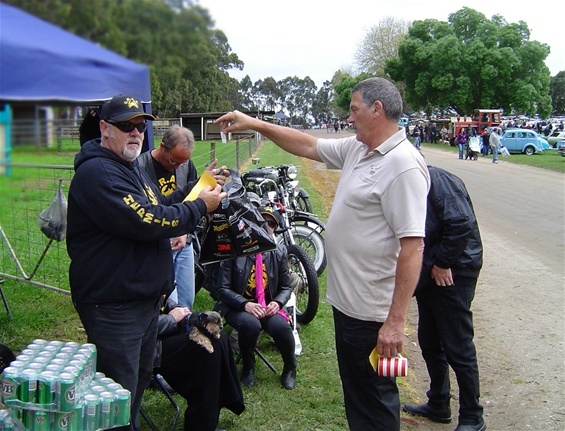 Although the weather bureau forecast a few showers, it was bright and sunny when the crew set up at The Vintage Shed, Tyabb. Steve towed the van there and Rowan towed a trailer of wood for our raffle, and before long both the awning & gazebo were set up, the generator was running (thanks Steve), the table and chairs were in place and the BBQ was alight. The catering crew, Sylvia, Dave, Marisa and Rowan had done a great job in organising the event and all we needed were a few paying customers. It wasn't too long before a few hungry early birds arrived and eagerly tucked into some freshly cooked snags and Devonshire Teas. 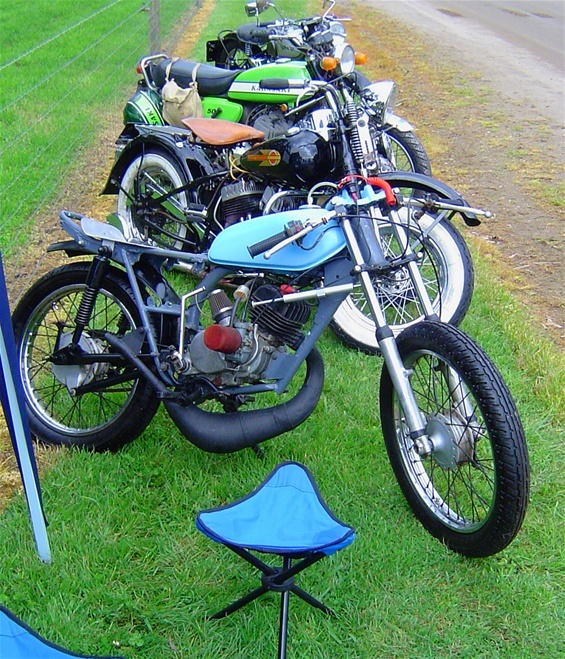 Sales were steady all day and I'm sure the bike display attracted a few curious onloookers. The wood raffle also went well. It's fair to say that these things just don't arrange themselves so thanks to Steve, Jenny, Rowan, Sylvia, Dave, Sonja, Marisa, Ross, Lyn, Dennis, Marcus, Berni and Tony who put in to make it a successful day for the Hermits. Special thanks to Sylvia for her delicious scones, Marisa for the yummy banana cake, Rowan for organising the sausage sizzle and Lyn who looked after all the financial issues (and provided the homemade blackberry jam) on the day. 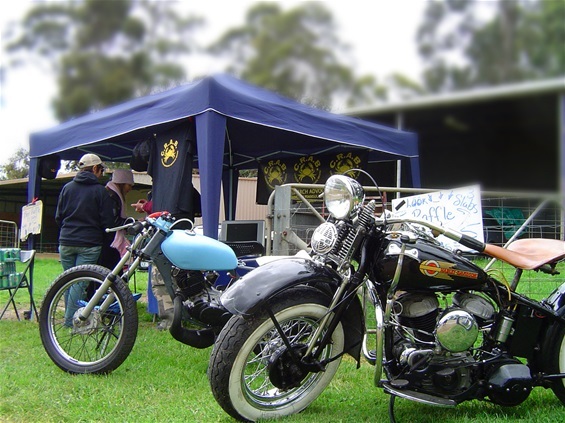 Thanks also to The Vintage Shed, and the family and friends who made an effort to support us. Well done guys, it was a hit and we raised some much needed funds for cancer research. The van, gazebo and bkes. The van ready for business. Rowan cooks up a storm.. It was a bright sunny day when we arrived at the Eastbourne Primary school for the Rock 'n' Rods show. 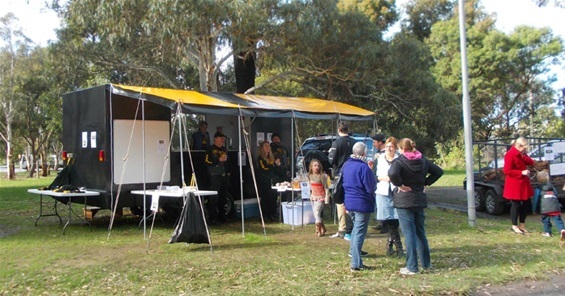 We unloaded the car and trailer, set up the gazebo, table, displayed the raffle prizes and hung the banners and then moved everything to the right about one metre. Fortunately the local scouts were ahead of us and already had the sausages, egg & bacon rolls, burgers and coffee on the go. Thanks for that guys - after an early start on Sunday the breakfast was well appreciated. 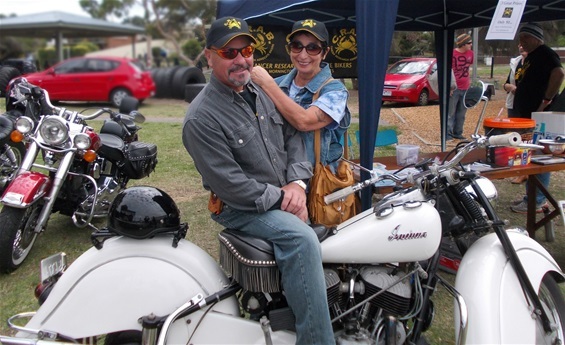 We soon had a full crew of Crabarians, Doug, Anne-Maree, Dave, Sylvia, Dennis, Lynn, Billy, Marisa, Berni and Marcus, and it wasn't long before the display cars and people started to arrive. 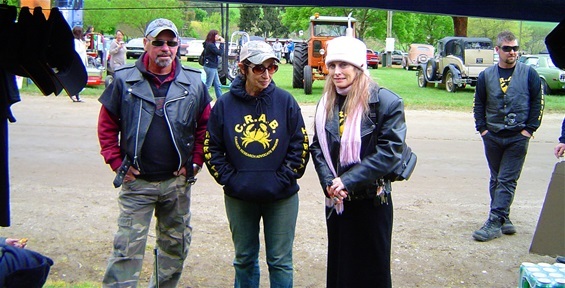 Billy, Doug and Dennis had brought their bikes along which made quite an impressive display and helped draw an audience. 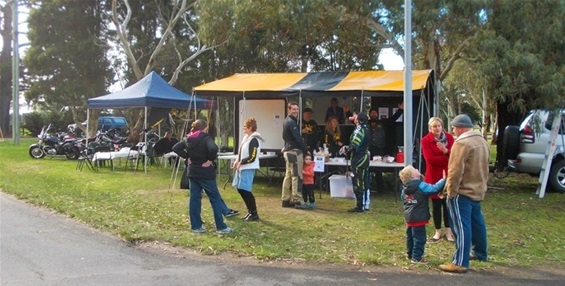 The raffle sold well, we increased our membership and the club and its objectives were well received by the public so it was a successfull and fun day out. In fact I've heard that a couple of members had a bit of a dance in the hall where the rock and roll band was playing. Thanks to R&E Autos in Rosebud who kindly donated the car care pack as first prize, Sylvia who donated an Indian Head Massage as second prize and MAQUAY in Hastings who donated a restuarant gift voucher as third prize and to the Crab members who made it all happen. Billy and Marisa on the Indian. 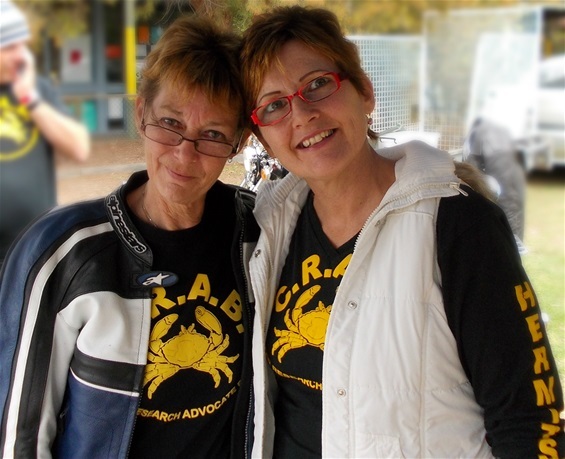 A couple of friendly Crabarian ladies. Doug and Anne-Maree doing a great job of selling tickets. 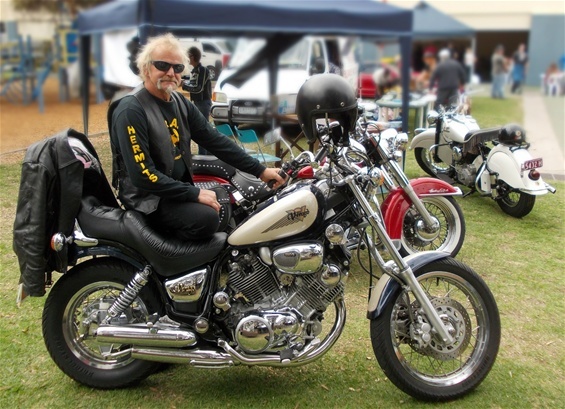 Dennis and his bike on display. Peter, event manager, draws the raffle. On Sunday October the 7th. 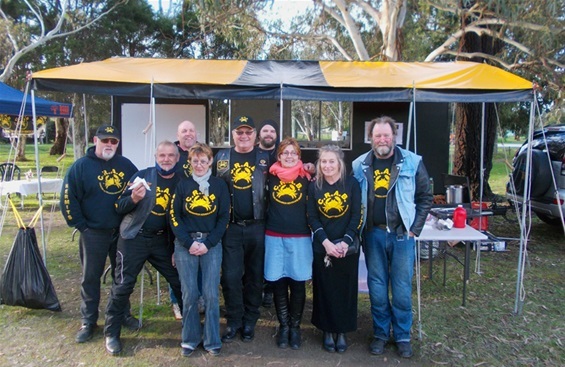 the Mornington Peninsula Hermits participated in its first promotional and fundraising event. Although the weather didn't appear to be the best we decided to go ahead. 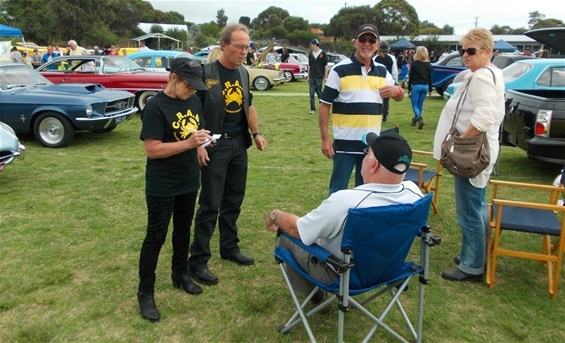 We all met at Lardner Park Exhibition Centre for the "Last Of The Chrome Bumpers" automotive show. The event is very popular with the automotive community and we all felt it would be a great idea to promote the club at such an event. 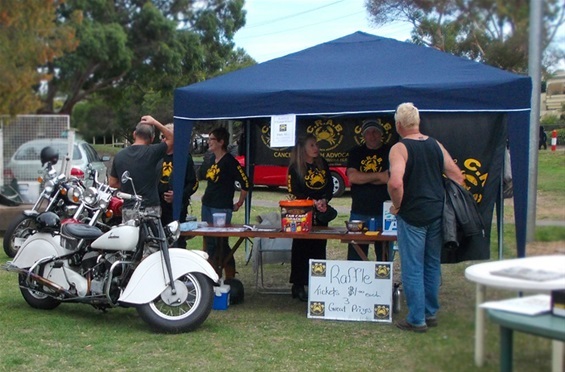 We set up our gazebo, hung the banner, arranged the flyers, laid out the merchandise, wrote the signs for the raffle and parked the bike display and waited for the crowds to arrive. After about an hour of looking at an empty paddock we all started to worry a bit but soon the crowds and display cars arrived in their droves...must have been the fact that daylight savings had started the night before and everyone was an hour behind. Phew! 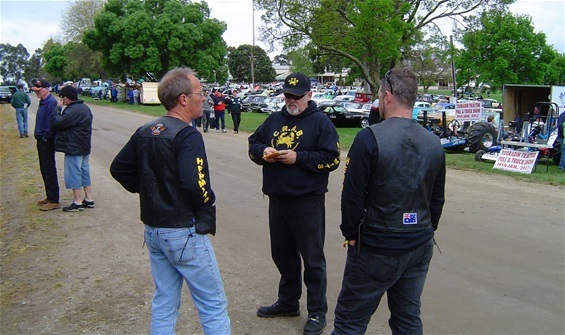 A dedicated team of Hermits then mingled through the crowd selling raffle tickets for three slabs of beer while the other members remained back at Hermits head quarters to answer any questions about the club. Sales went extremely well and soon we had to send out for some more raffle tickets. Within a couple of hours we had sold our legal quota of tickets so we decided to draw the raffle early. Kevin Beilby, the event organiser and vice president of Cora Lynn football club, drew the raffle. The winner was Tom Pontikis of Camberwell. Tom seemed most happy as he left with the three slabs of beer. 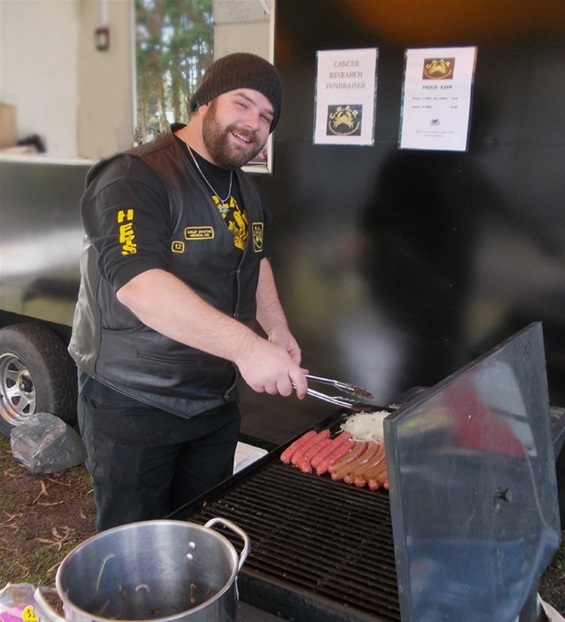 Many thanks to Steve, Marisa, Billy, Rowan, Shelley, Doug, Anne-Maree, Billy R, Dennis, Marcus and Berni who put in a lot of effort to make the event successful. The weather held up and at times it was even quite warm. The stand was well received and lots of flyers were handed out to interested people who wanted to know what the club was all about, in fact the club received many donations on the day. Thanks also to Paddy and Sally, Marisa and Billy's puppy dogs and now the unofficial club mascots, who seemed to attract more attention than the display bikes :). A great day was had by all and it turned out to be very profitable for the club. Thanks to all the members who put in to turn an idea into a reality. We're looking forward to the next one. The guys formulating a battle plan. 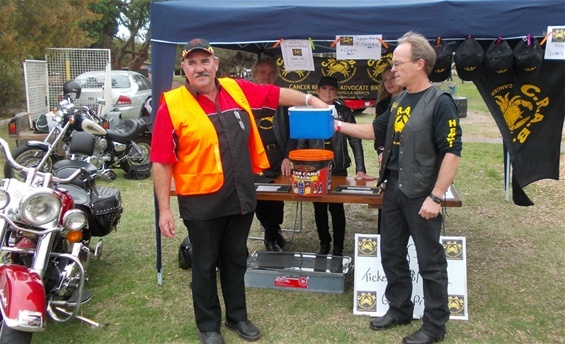 Kevin Beilby, event manager, draws the raffle.